This Dominator 88 has undergone a full restoration. The bike rides as good as it looks thanks to the featherbed frame and Roadholder forks. 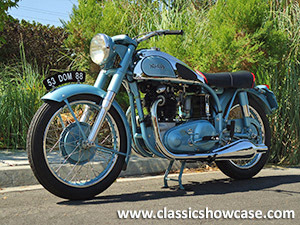 This motorcycle has been completely restored with only 28 test miles since the restoration. Titled in California with VIN# 50258 but the bike is stamped 12250258. The Dominator is a twin cylinder motorcycle developed by Norton to compete against the Triumph Speed Twin. The original Dominator was designed in 1947 and 1948 by Bert Hopwood, who had been on the Speed Twin design team at Triumph. This design set the pattern for Norton twins for the next 30 years. The Featherbed frame was designed for Norton by the McCandless brothers and made by the Reynolds Company because the Norton Works did not have the necessary welding capacity for its manufacture. The Featherbed frame led to the Model 88 Dominator, also called the Dominator De Luxe, which used the same 497cc engine and was developed in 1951. Originally developed for export it was sold on the home market from 1953. Dominator production ran from 1948 until the 1960s.